I know I seem say this about every room reveal but the guest bedroom is one of my favourite rooms in our home! 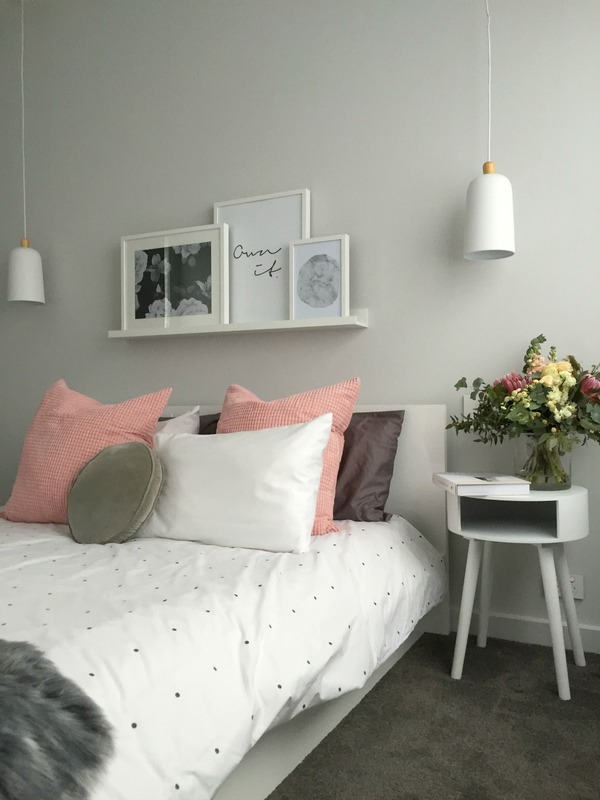 With my family living interstate, I knew this space would get used A LOT and especially so since having baby P. My goal was to create a cosy and inviting guest bedroom and I feel like I was able to achieve this. 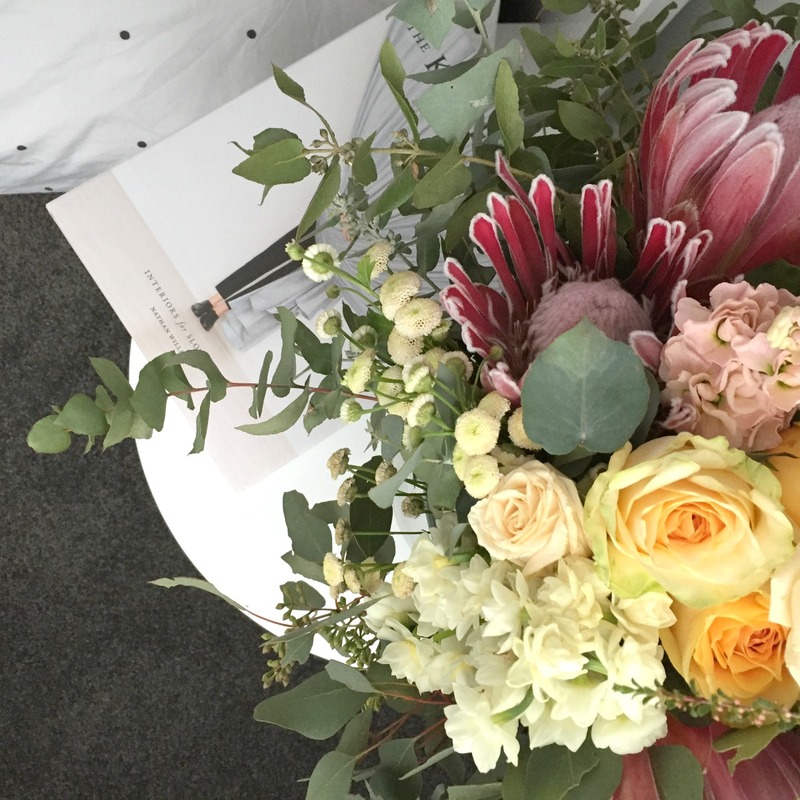 During my colour consultation with Erin from Haymes, she suggested a soft grey wall colour called ‘Soothe’. That was the first decision I made when planning the guest bedroom and I love the mood it creates. The next big decision was the joinery and I selected a grey timber grain finish called ‘Marosa Milan’ from the Ravine Polytec Evolution range. 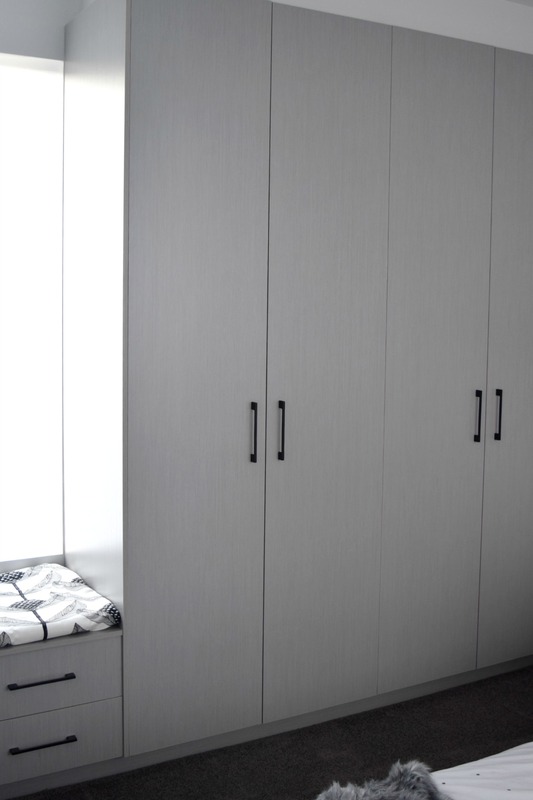 I designed the wardrobe to go across the full width of the wall with a lower drawer unit below the window to create a little reading nook. Perhaps I went a little overboard with storage in this room but often my guests will stay for a week or longer so it’s nice to give them space to unpack all their things and get settled. 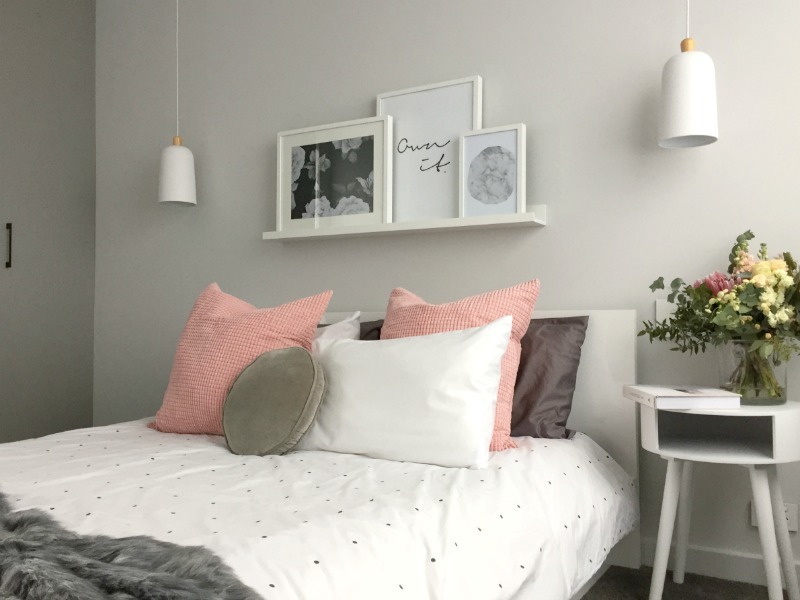 The room layout is simple — a bed centred against the back wall with two pendant lights hanging either side, and a side table on the right of the bed. There isn’t space to have a bedside table on the left side so I bought some light grey Normann Copenhagen wall pockets that can hold magazines, reading glasses etc but in the end I didn’t feel these were needed and used the wall pockets in my study instead. I (my husband) installed a wall shelf above the bed to rest artwork, candles or other pretty things. At the moment I’ve got a collection of prints from Yorkelee Prints on display but I also bought some larger frames so I might play around a bit more with the styling on the shelf. On to my favourite part! With the design and layout decisions made, I could furnish the space. To create that cosy feel, I dressed up the room with lots of layers. 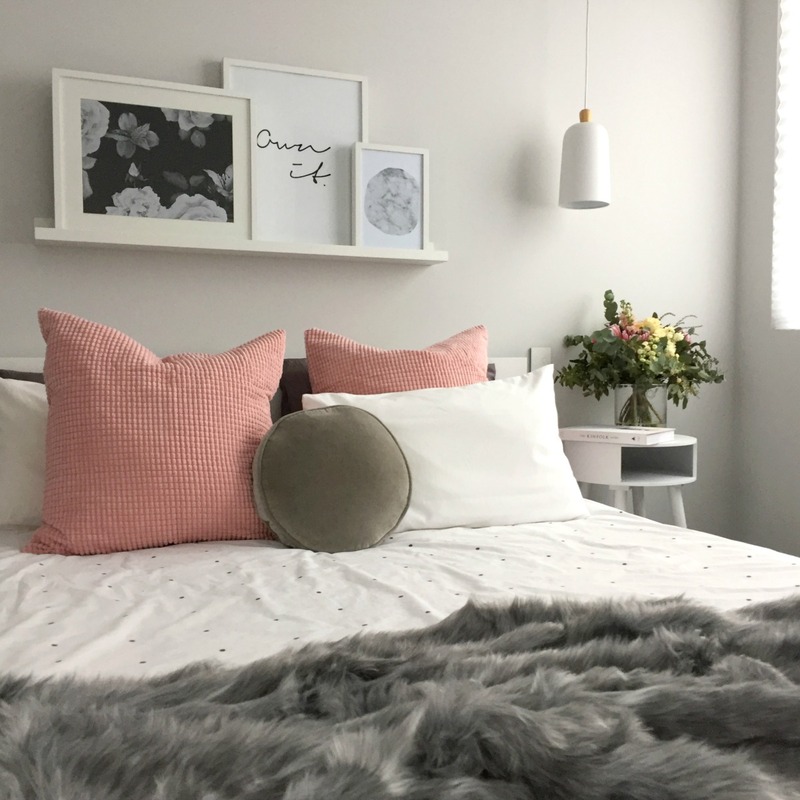 Those blush pink Euro cushions are new at IKEA and are so velvety soft ♥ The bedding is by Rachel Castle and the large faux fur throw from Adairs. My mum, who was the inspiration behind this room, loves to read so I created a little reading nook by the window. The bench seat is a little DIY number using fabric from Yulki’s Home Decor and I scattered a few cushions in different geometric prints. Finally, fresh flowers and a good book finish the space. Very Scandi vibe and great colour choices! Such a sweet room, lucky you like your guests to stay a while 😉 The paint colour is perfection, is that a darker grey than the rest of the house? 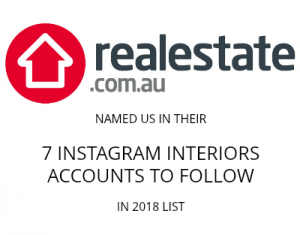 I totally thieved your wardrobe/window seat configuration for one of our bedrooms btw! He he, glad you got some ideas from this space Jane! 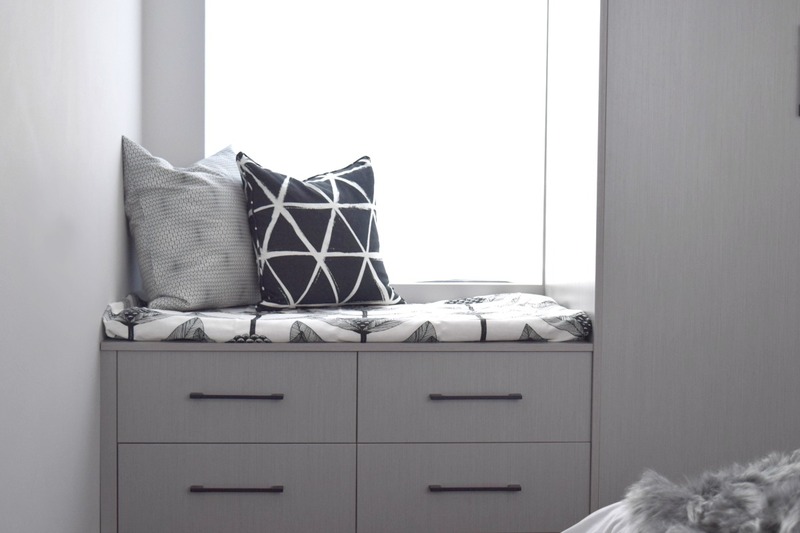 I’m lucky I have nice guests so I let them stay a while 🙂 The cabinetry in this space is one of my fave features so hopefully you love how it turns out in your new home too! The paint colour is ‘Soothe’ which is a soft grey colour whereas most of my house is ‘Greyology 2’ which is a crisp white. In our master I used ‘Smokey Silhouette’ though which is a medium grey. Next time I build I think I’ll be more confident using colour… it was a big step for me to lock in these two grey colours, ha ha! The greys are lovely but I think I know what you mean about being braver next time. I am loving all the moody warm colours right now but we will see when it comes to the crunch whether I follow through!